Hospitals and other health-care facilities have specialized toilets built into the facility. 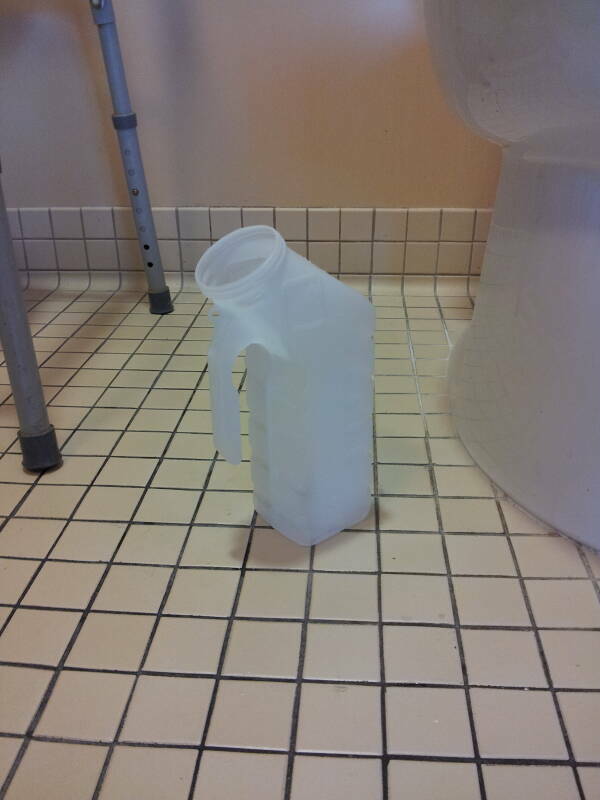 But when a patient goes home, normal bathroom activities can be difficult. Some of the same systems used in the hospital can be used at home. 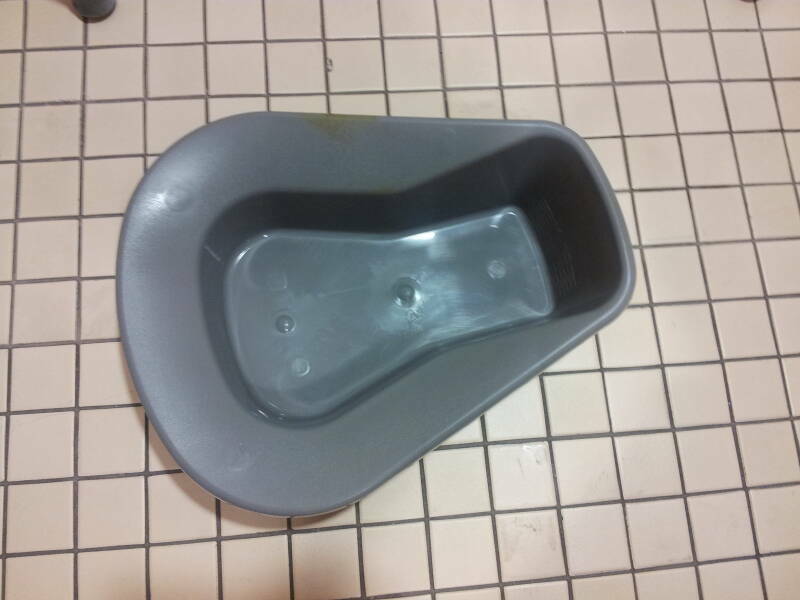 Of course the standard bedpan and handheld urinal used in the hospital or rehabilitation facility can be used at home. Forget about the large, heavy, stainless steel bedpans and glass urinals, those are long outdated. Modern ones are plastic. They're lightweight and far cheaper than the old models, meaning that they can economically be discarded and replaced after a number of uses. 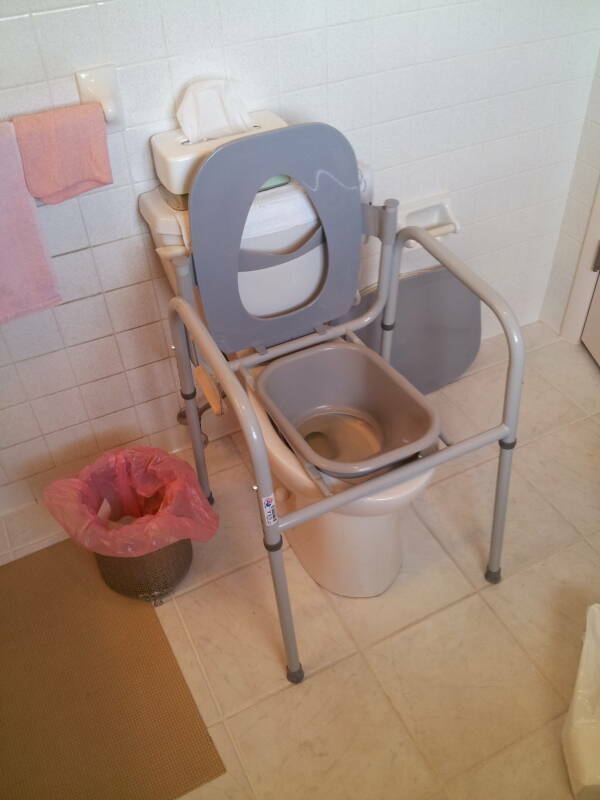 A portable "three-in-one" commode, basically a portable toilet, can be brought into the bedroom and placed next to the bed. 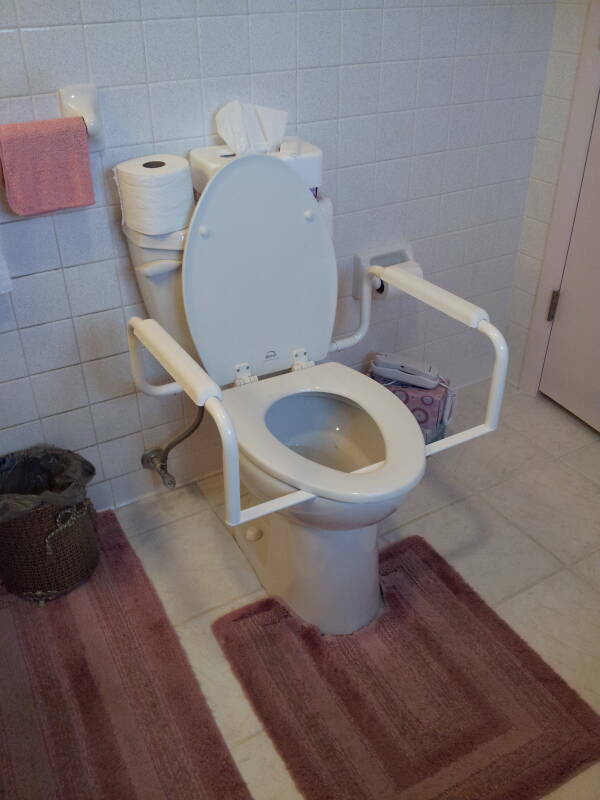 This would be helpful for patients who can get out of bed on a very limited basis. They can get out of bed but they cannot easily or comfortably move more than a few steps. 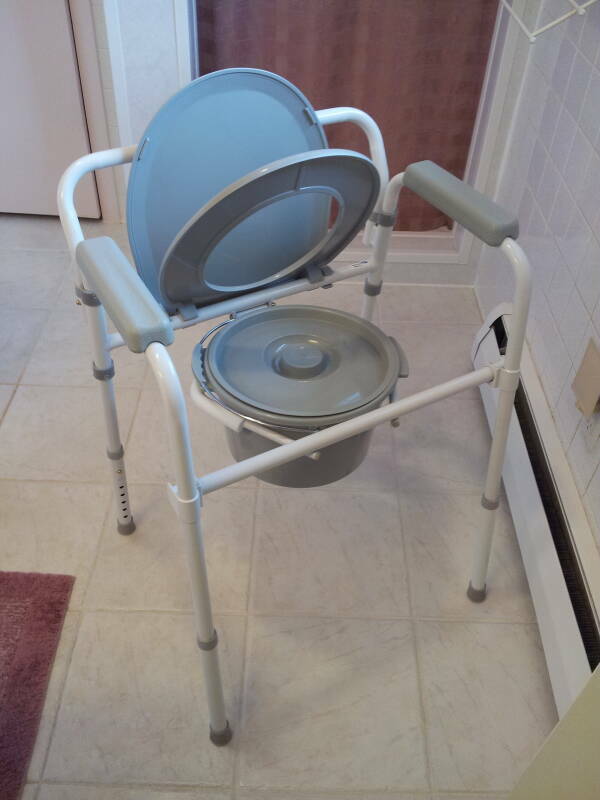 When the patient can move a little further but still finds the standard commode difficult to get on and off, the three-in-one can be placed over the toilet to provide a raised seat and sturdy arms. Let's look at examples of each of these in turn. Modern bedpans are made from plastic. They can be cleaned for re-use, and in a hospital or other health-care facility they will then be sterilized in an autoclave. But they are far cheaper than the old stainless models, meaning they can economically be discarded and replaced after a number of uses. 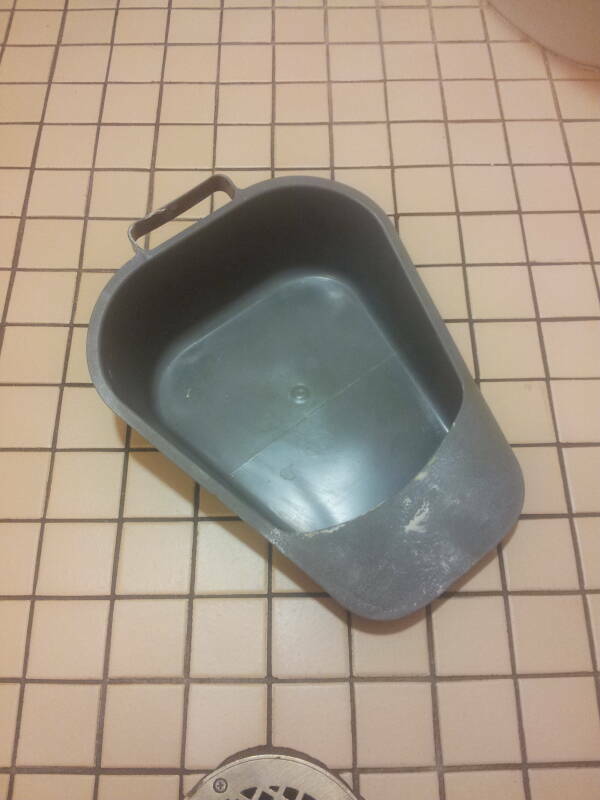 The first bedpan you see here is the standard design, made from plastic. The second is a fracture bedpan, used for patients who have fractures of the pelvis or femur or who have had hip replacement surgery. The leading edge forms a sharp angle, making it relatively easy to get it positioned under the patient. Male patients use handheld urinals like the one shown here one, and female urinals are also available. They are marked like graduated cylinders along one side, allowing you to record urine production to an accuracy of 25 milliliters or better. 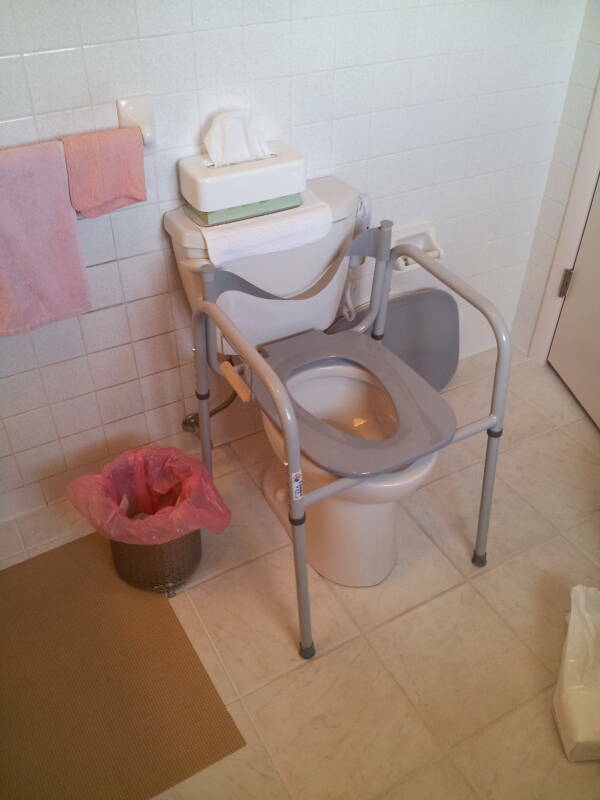 Here is a three-in-one portable commode in a recently released patient's home. The same type of unit is also used in a hospital or rehabilitation facility in the same ways — either brought next to the bed for patients who are limited to a few steps out of bed, or placed over the toilet for a higher seat and arms. You can see here how you remove the bucket and leave the "wind tunnel" in place to make sure that all the waste ends up in the toilet bowl. Unfortunately, in a home setting you won't have a handy spray head for cleaning the tube and washing the rinse into the toilet. Here is a second design for a "Three-in-one". The "wind tunnel" of this one is shaped more like a standard toilet bowl. 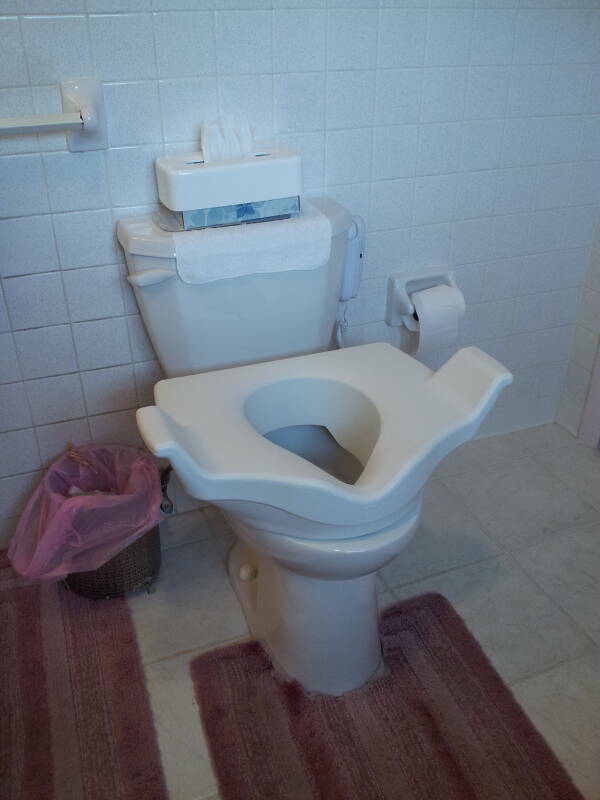 This one can be lowered a little closer to the rim of the bowl, so it can function basically as a replacement seat with sturdy arms for getting on and off of it. 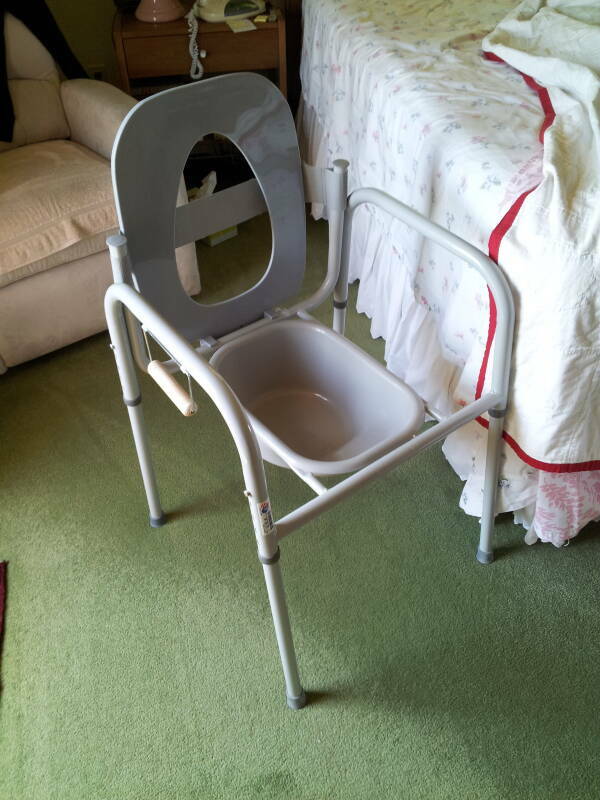 If you place the closed bucket on it, it could be used in a bedroom, allowing the patient to use a toilet rather than a bedpan but without the need to move more than a step away from the bed. 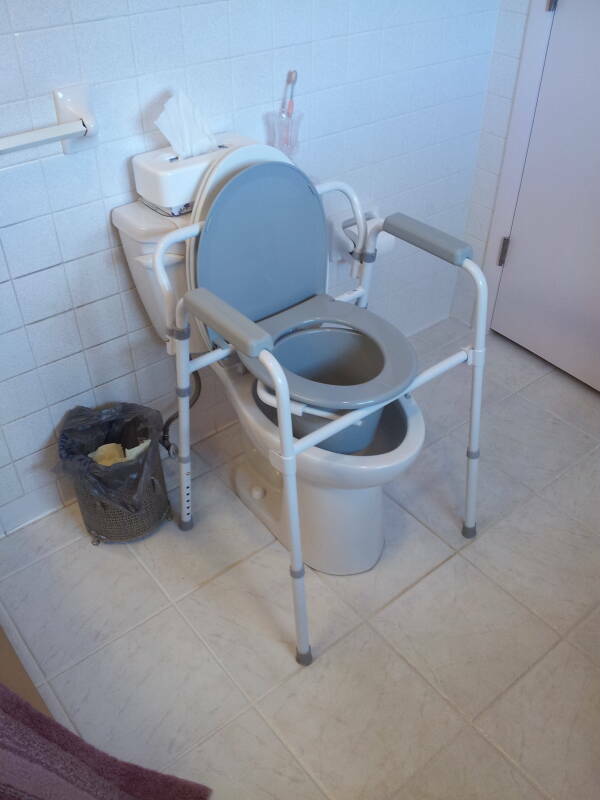 One drawback to most "three-in-one" bedside commodes is that the opening in the seat is rather small, perhaps no more than 10 inches or even slightly less front to back. 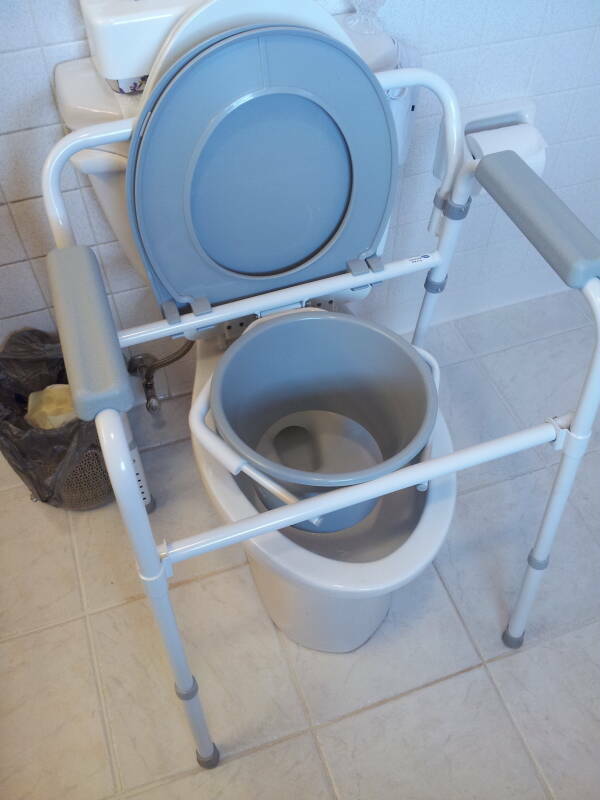 You can add a booster seat to a toilet, raising the seat level 4–5 inches and providing small handles to help the patient lower and raise themself. 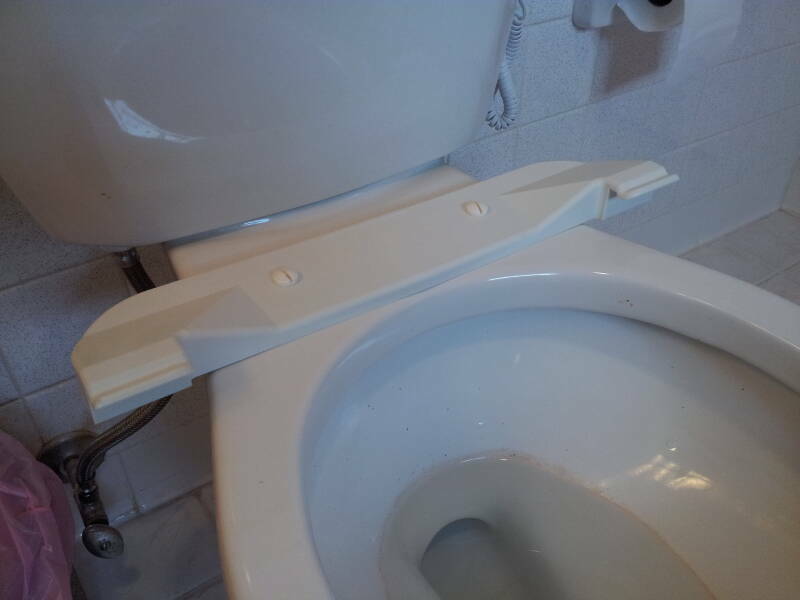 The opening is at least as large as on a conventional toilet seat, making these more comfortable and easy to use. Be careful: some of these booster seats simply sit on the rim of the bowl and are not stable. Make sure you get one that snaps into tabs on a bar you mount in place of the original seat and lid. 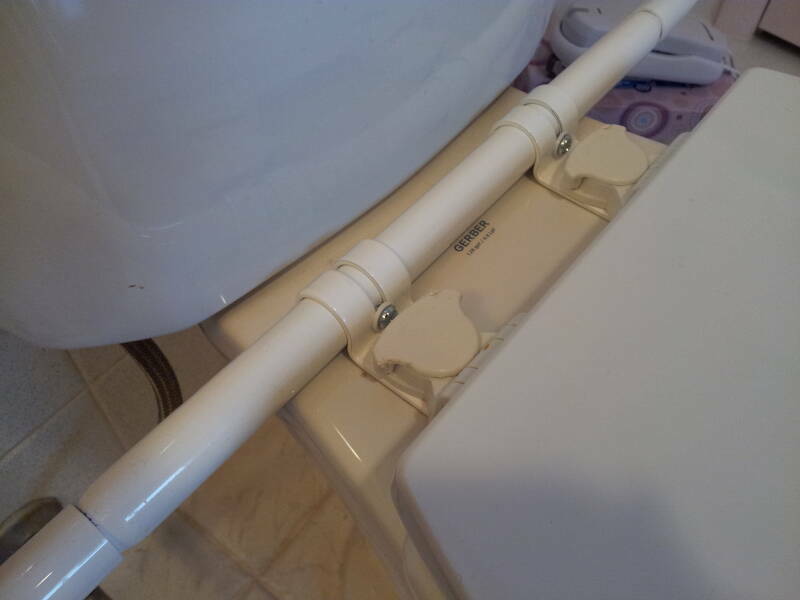 The one pictured is a Moen product widely available in home-improvement stores in the U.S. When the patient graduates back to a conventional seat, assistive hand rails can be very helpful. Some of them extend down to the floor, but that makes for a significant trip hazard. Some attach to the seat mounts and swivel up out of the way, there is nothing to trip on. 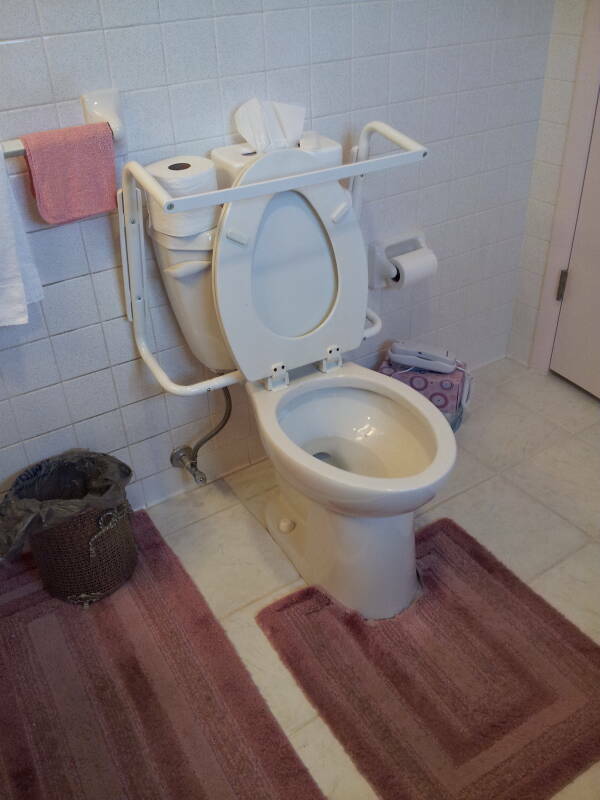 You simply remove the seat, and then install both the hand rail mounts and the seat on the same nylon mounting bolts.